Ting-Ju Shao presents Ryan LaBar form the US and Kayoko Hoshino from Japan. Over the last four decades, Antje Scharfe has vigorously pursued her aesthetic of abstracting the vessel form. 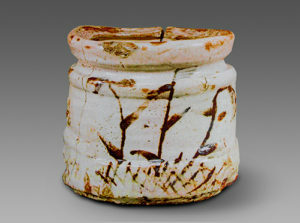 This path has evolved from an emphasis on the surface of functional, or at the least semi-functional forms, to flattening the piece but maintaining a narrow opening, in what she calls “Kultvasen” (cultic vases), to creating still lifes of trompe l’œil bottles, and ultimately assembling totally flat silhouettes of vessel forms with poured translucent porcelain slip mounted in blocks of paraffin. One might ask why the emphasis on the vessel? Why is it so central to Scharfe’s work, considering that her interests lie so far afield from functionality? 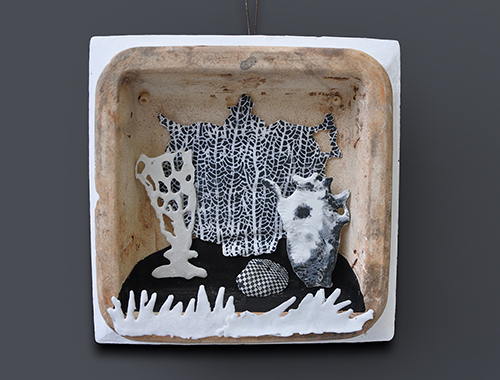 To this she replies “I’m a ceramic artist and for me the vessel is central to ceramics.” She further explains, “My ceramic is about ceramics, so naturally the vessel remains paramount.” That being said, Antje acknowledges her somewhat unconventional approach. “I make fakes,” she jokes, regarding her largely nonfunctional pieces. 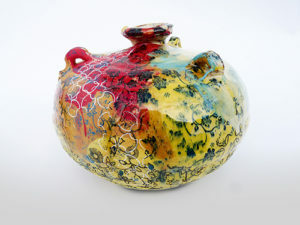 That was not always the case, as her very first clay pieces were figurative and good enough to gain her admission to the University of Industrial Design in Halle an der Saale**, considered the premier school for ceramic art in the former East Germany and likely now in the united Germany. 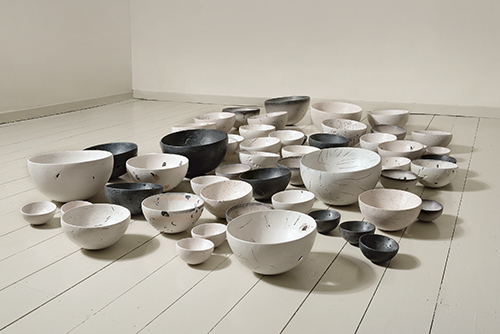 The sequence of bowls made over the past two years marks a re-start for Perryman; a new way of using her skill, her eloquence, with the limited palette of materials, methods and forms that she has mastered over twenty years. She came to her signature working methods slowly, discarding more elaborate techniques of glazing and slip-casting, to focus on hand-building and smoke firing. She has described her approach as “a few things well-explored”. Using press moulds and slab building, she is known for individual sculptural pieces, often of two parts: a flat gently curved rectangular form paired with or supporting a generous round-bottom bowl, the surfaces of both unglazed, burnished and marked by smoke. Still and white they stand. Small bowls and sculptural vases fill the shelves of Ingrid Ripke-Bolinius’s studio in Worpswede, North Germany. After throwing, she has not simply put them there but has consciously arranged them so that they form pairs or small groups with an aura that deeply moves the viewer. It is almost impossible to stop looking, and one looks and looks again, sensing the calm and the aesthetic of these porcelain pieces. It is in this that secret of the Ripke-Bolinius’s work lies. Ripke-Bolinius first encountered porcelain as a fifteen year-old. While she was training as a shop-window designer, she was often tasked with arranging porcelain objects. Even then, the material fascinated her to such an extent that she purchased porcelain bowls, not realising that they were harbingers of her future. Her career as a craftswomen began with a study of clay. She says the experience that she gained of this material sealed her fate. “It sharpened my perceptions, shaped me and gave me the feeling that there was a point in living this way.” Life and work thus formed a unit where emotions and experiences from both areas flow freely to and fro. Ripke-Bolinius is familiar with a fundamental connection to daily work having grown up on a farm. In both areas, one is affected by crucial questions and problems involving matters of one’s very existence that directly influence one’s work. 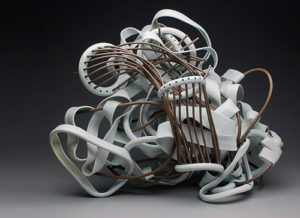 In the development of her work, the transition from earthy clay to delicate porcelain may not have evolved solely from developments inworking with the material; it may instead be based on fundamental individual processes. Ripke-Bolinius turned to porcelain to express greater lightness and openness in her vessels. 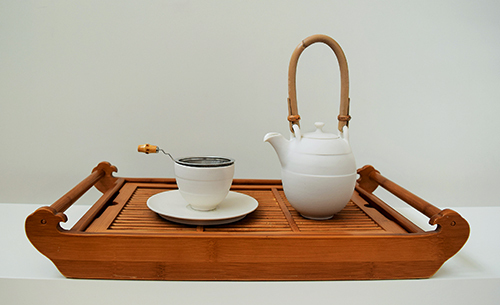 She explains, “The delicacy, elegance and demanding level of craftsmanship required in making porcelain fascinate me. Rembrandt, as one of the most famous Dutch artists, not only inserted himself in his historical paintings, but also made a series of portraits of himself from a carefree boy, an accomplished artist, to a sombre and wise old man. Self-portraits as they are, they are not traditional ones. Viewers standing in front of the depictions of his slowly changing faces catch glimpses of the vicissitudes of an artist’s life and career. Franz Xaver Messerschmidt (1736-1783) is known for a series of bronze or marble busts of his exaggerated grimacing faces cast in a modern style. As noted by the German writer Friedrich Nicolai, to divert his attention from the illness that he had been suffering, Messerschmidt constantly pinched the right side under the ribs, and recorded his observations of his facial expressions in the mirror. 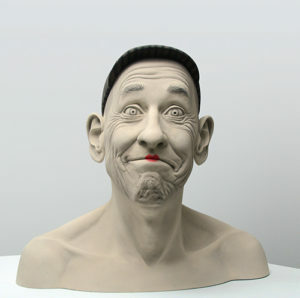 The result is this series of screaming, guffawing, jesting, mischievous, or painful head sculptures. Many figures move by reflecting the progress of life of their creators, their every taste of the peaks and valleys of life. These autobiographical or semi-autobiographical records are animated by the enunciations of the ordinary, joyful, secret, and heavy sides of life. 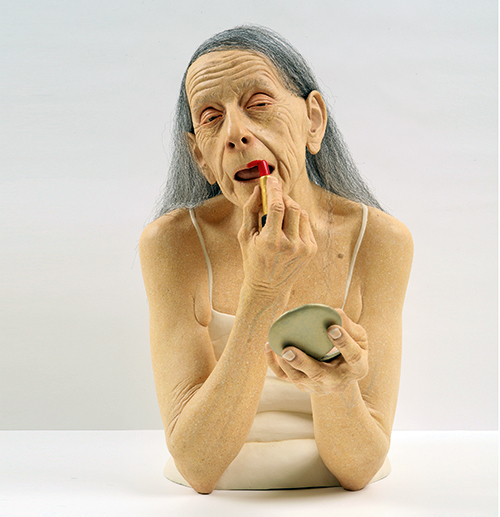 The contemporary American ceramic artist Tip Toland also kneads every experience of her life into her figures, which, like us, are born in the river of time, and then grow, age, and die. From birth to death, the bifurcation of life leads people to variant degrees of sorrow, joy, sadness, and anxiety. Thus infants, boys, and old men are all Toland’s subjects, which are presented in a surrealist way to stage the dark and bitter sides of humanity vigorously for the reflection and attention of the viewers. Every year, the Ceramic Portrait at the Oldenburg International Ceramic Fair presents a veritable feast for everyone who is interested in contemporary ceramics, professionals or amateurs, practically or theoretically involved in ceramics: two internationally renowned top ceramists present their work in talks and demonstrations over the whole day; and it will be no different in 2016, on 5 August in the new city centre premises of the Werkschule – Werkstatt für Kunst und Kulturarbeit (the Workshop for Art and Cultural Work). In Lut Laleman from Belgium (top) and Johannes Nagel who works in Halle an der Saale (right), two ceramists have been persuaded to take part who are in the spotlight internationally – not least because both of them have recently developed new artistic concepts for porcelain. Since its start in 2005, Ceramic Art London was firmly linked with the Royal College of Art and had its home in the smart white-walled foyer of the modernist Darwin Building in Kensington next to the Royal Albert Hall. This year, taking place for the 12th time from April 8-10, 2016, CAL surprised its visitors with a new venue and a new partnership with the arts college Central Saint Martins. 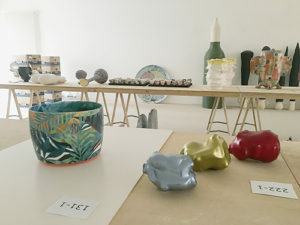 This is the only college left in London where you can study ceramics for a bachelor’s degree. 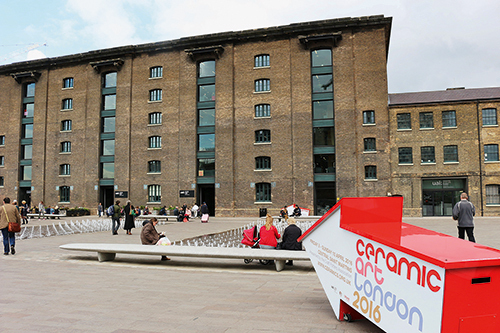 In 2011, Central Saint Martins moved to the so called Granary Building, a grade II listed Victorian building used to store wheat for London’s bakers during the second half of the 19th century. The building underwent a £200 million renovation by Stirling Prize winning architects, Stanton Williams and is part of the exciting King’s Cross Development. Started in 2001, this is the largest area of urban redevelopment in Europe, transforming industrial wasteland into a new part of the city with homes, shops, offices, galleries, schools and the University of the Arts, fast becoming one of the most attractive places to live, work and visit in London. I was curious to see if or how the move to this exciting part of London would change the atmosphere and experience of visiting CAL. When stepping out of Kings’ Cross Underground and approaching the Granary Building through King’s Boulevard and Granary Square, all packed with people, it became quickly apparent that this was indeed the case. Bold 3D arrows installed along the way to the entrance gave clear directions and succeeded immediately in conveying a young contemporary design image. The Granary Building itself is stunning. The old parts of the building are joined by a long covered “inside street”, which formed the perfect backdrop for the fair and supplied beautiful natural light radiating from the glass roof three stories above. CAL’s stands were always well-presented and professional-looking, but while the Royal Kensington supplied a more intimate setting this generous and airy space made the stands look even smarter and tempted the visitor to experience the fair with curiosity and a fresh eye. I have ben attending the NCECA conference in various US cities for many years, regularly accompanying my husband Jimmy Clark, who knows the international world of ceramics very well. Through him, I see NCECA to some extent through American eyes, but always as an outsider too. The conference is called “national”, but it is so international that it could not be improved upon in this respect. Ceramics makers and other interested parties come together from all over the world. In the hall, a giant space in each congress centre, everything that makes a ceramist’s heart beat higher is offered for sale. Tools: you can find the best from all over the world and many things you have never seen before. Universities and centres offer their courses. All the important ceramics magazines are represented there. And the hall is the place to meet. 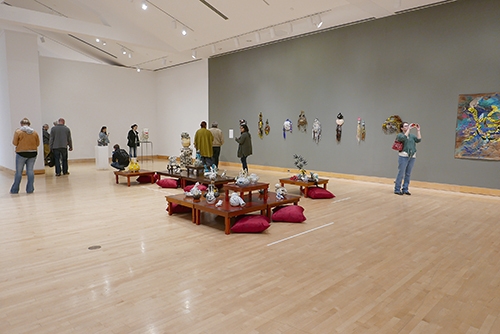 Every NCECA conference has a fantastic range of solo and group exhibitions. The number and diversity are almost excessive here too and you have to learn to filter what is important for yourself. Shuttle bus tours are laid on to the various exhibition venues so you can see as many exhibitions as possible. The bus tours went to over 100 exhibitions in the city and its surrounding area. It was usually possible to find out about the countless exhibitions not included in the official programme by word of mouth in the hall. By the way, especially as a German I have repeatedly noticed how well the Americans can organise. This year, the NCECA celebrated its 50th anniversary. The leitmotif of „Makers, Mentors and Milestones“ ran through all the major exhibitions for this occasion. In 2016, work by important and revered members of the organisation was shown. 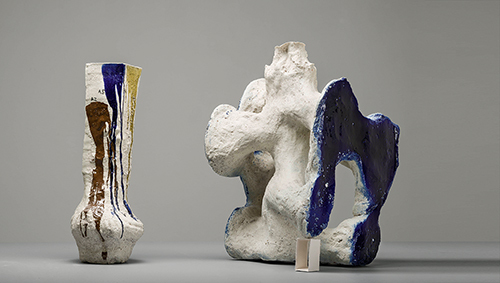 All the brightest stars of contemporary American ceramics were represented, as were the luminaries whose influence has changed and enlarged the organisation NCECA. It is incredible to realise that the attendance in 1966 has risen from a few dozen in 1966 to today’s record figure of nearly 6,000. 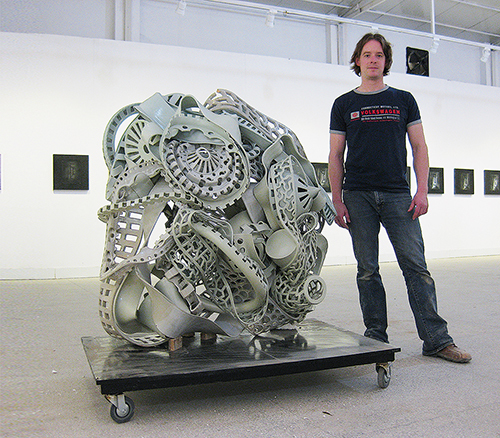 Ryan LaBar was born in Great Falls, Montana, U.S.A, in 1975. Gry shares her love of nature and plant fibres with her mother and her grandmother, who both wove “åkler”. 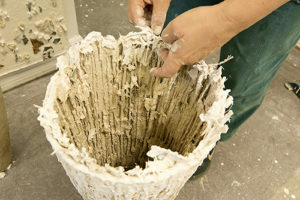 In the following interview she tells us what that is and how she integrates plant fibres in her ceramics. Q: Gry, you live in the very north of Norway. Does the harsh climate and the landscape influence your work? A: I have always felt very close to nature and I have always enjoyed studying natural textures. The dimension of nature that appeals to my senses gives me inspiration. Q: You not only attended art school but you also studied architecture in Oslo. Did you want to change jobs? A: No, while I was doing research into the development of materials at art school, the art school and school of architecture cooperated and the school of architecture provided the scientific skills and the research training. Q: You have participated in numerous exhibitions. 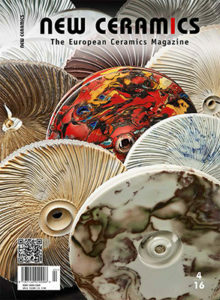 Is it very easy to exhibit ceramics in northern Europe? A: No, I wouldn’t put it like that. We have a lot of talented professional craftspeople and only a few forums dedicated exclusively to craft. Juries select participants for most exhibitions, unless of course you are invited to participate. Kaolin gallery in Stockholm exhibited the project Biotope because of its experimental quality. Biotope was the result of an experiment with materials and includes a video installation interacts with two groups of objects. I wanted to share with the visitors the experience of nature, texture and touch. Apart from that, the National Museum of Decorative Arts and Design in Trondheim is outstanding. It has a collection of craft work and it also has good exhibitions of contemporary ceramics and crafts. It was an honour for me to execute and show the project Klangbilder (“Acoustic Patterns”).